The artist and the model—sometimes one and the same—are the subjects of Modeled Bodies. This exhibition centers on Richard Diebenkorn, Larry Rivers, and David Hockney, and the intimately known models who repeatedly populate prints made at specific moments in their careers. Phyllis Diebenkorn was the subject of numerous intaglio prints made by her husband as he explored printmaking seriously for the first time, in 1964 and 1965. Rivers turned his attention to model and one-time girlfriend Diana Molinari in the first half of the 1970s. 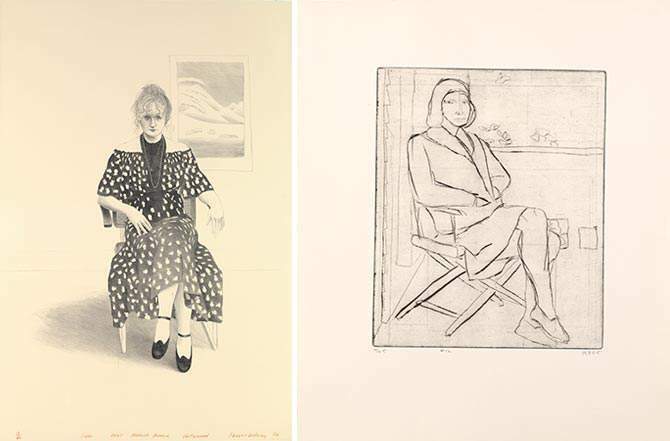 Close friend and patron Celia Birtwell features in a group of lithographs Hockney made in Los Angeles in 1973. Examples of these works are joined by a selection of self-portraits and portraits of other artists and art-world figures, including prints by Marisol and Kiki Smith.